Chrysler Sebring Convertible is "The Perfect Escape"
Since its introduction in 1996, the Chrysler Sebring Convertible has seen several changes in form. Now, in 2010, the vehicle embodies a sleek and sculptural design, making it the stylish rental car for those of us who want to experience the Hawaiian Islands with the wind in our hair, while surrounded by luxury and comfort. Imagine yourself wheeling into Lahaina at sunset after a day of sightseeing. Wouldn't you find the experience more fun from the vantage point of a convertible? While this is not the vehicle to drive to Hana, the Sebring Convertible will take you across Maui, as well as the other Hawaiian Islands, in class and in style. Unlike many convertibles, this vehicle provides comfortable seating for all four passengers. The roads in Hawaii are not the most refined, but with four-wheel independent suspension, Sebring Convertible passengers will always ride comfortably. Backseat passengers can also enjoy the roominess of this car-- more rear seat space than any other in its class. 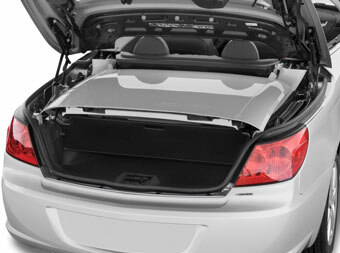 This convertible offers amazing trunk space! A few years ago we rented a Chrysler Sebring Convertible to experience its performance on island roads. While we found the vehicle comfortable and pretty to look at, it had little trunk space when the top was down. Chrysler has redesigned convertible-top storage space so that the car now boasts a sizable trunk. Two golf bags or about four average pieces of luggage fit easily in the trunk. Raising and lowering the top into hidden storage is completed by pressing a button. "The Perfect Escape" is Chrysler's description of their Sebring Convertible. Yet, isn't this also the ideal characterization of a vacation in the Hawaiian Islands? When you fly off to Maui, or one of the other tropical getaways in Hawaii, you are counting on the perfect escape from everyday routines. Renting a Sebring Convertible completes your getaway.